Chef and James Beard Award-winning author of "Salt, Fat, Acid, Heat," Samin Nosrat explains how make tender pork chops every time. If you've ever tried (and failed) to cook the juiciest, best tasting pork chops, the first thing you need to do is give up any notions you might have about pork being "the other white meat," as it was marketed in the fat-phobic 1980s. "To me, a lean pork chop is the saddest possible thing," Samin Nosrat, cooking teacher and author of the James Beard Award-winning cookbook "Salt, Fat, Acid, Heat: Mastering the Elements of Good Cooking," told TODAY Food. "The challenge of those tender cuts [like pork chops] is retaining that tenderness after you cook them," Nosrat explained. "In order to do that, you want you want to set yourself up for success, and the first thing to do is to buy the least lean chops that you can find." Nosrat shared 12 must-do tips (and the one thing you should never do!) for picking and cooking the best pork chops that you'll want to keep making — and eating — again and again. 1. Buy a marbled chop. You already know you don't want a lean pork chop, but you don't want just any old kind of fat when it comes to chops. "I believe, especially in meat, that fat is flavor," said Nosrat. "But there are different kinds of fat in meat." When you're looking for pork chops, the kind of fat to focus on is intramuscular fat — the variety that's responsible for marbling. Nosrat said you can look for a breed of hog known for its marbling (the kind of thing you might find at a farmers market or specialty butcher) or simply by going to the butcher counter at the grocery store and asking for a very marbled pork chop. Boneless pork chops often come from the end of the pork loin that's less fatty, so Nosrat recommended choosing bone-in pork chops, particularly T-bone style chops. "The ones that are specifically the T-Bone kind are from the part of the loin that is really the most flavorful," she said. 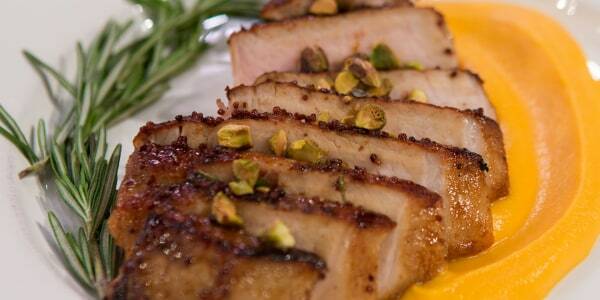 When choosing pork chops, look for ones that are rosy rather than pale pink. "Paler meat is a sign that it comes from one of the more heavily bred breeds that are about yielding more meat total and not necessarily having the highest quality meat," said Nosrat. "So you want something that has a nice rose-pink rather than something that's paler." For those who are worried about eating too much fatty meat, Nosrat posed this question: "What if we eat a little bit less pork and choose better quality?" She added, "I always am absolutely a proponent of looking for organic pork or at least from a farm where you know the animals have been treated well." There is also evidence that pigs that have been humanely raised taste better. So while that pasture-raised, heritage pork chop may cost more than a typical supermarket chop, a little bit of that flavorful, marbled meat goes a long way. 5. Salt the meat in advance. Nosrat told TODAY Food that one of the most important things when cooking any meat is salting it well in advance of cooking so the salt has time to penetrate the meat. This will make it more flavorful and help tenderize the meat. For example, she recommended salting a whole chicken a full day in advance before cooking, but pork chops require much less time. "The nice thing about pork chops is that they are pretty small, so I don't think you have to go through the kind of thinking in advance that I do for bigger cuts of meat like pork shoulder or a whole chicken," she said. "Since a pork chop is a small and tender piece of meat the salting in advance can be anywhere from 20 minutes to two hours." As for how much salt, it's probably more than you think. "Salt amounts will vary depending on what kind of salt you're using, but for most people, it's more than you're used to," said Nosrat. 6. Consider making a brine. 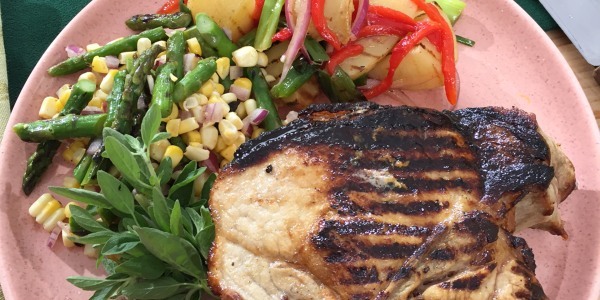 While simply salting pork chops is sufficient, if you have enough time, consider brining the chops to help them retain their moisture when you cook them. A brine is simply a solution of salt, sugar and sometimes added seasonings dissolved in water. "It doesn't have to be this big production where you measure everything and weigh all the stuff — it's just a matter of giving the meat some time to absorb some water and absorb some salt and sugar so it can be flavored all the way,"Nosrat explained. If you're brining, she recommended allowing the chops to sit in the solution anywhere from four to eight hours. "But if you don't have the time to do that, even just salting them and letting them sit on the counter for 20 or 30 minutes is plenty for some of that salt to make its way inside and let some of that tenderizing work happen," she said. 7. Never add cold meat to a hot pan. Nosrat stressed the importance of making sure your chops are not cold right before you cook them. "I would say the most important thing is bringing your meat up to room temperature before you start cooking it," said Nosrat. "If they are still in the butcher paper, separate them, spread them out so they warm up faster, because if it's cold on the inside, what's going to happen is the outside is going to get totally dried out and overcooked by the time you get the inside cooked." 8. Always preheat your pan or grill. 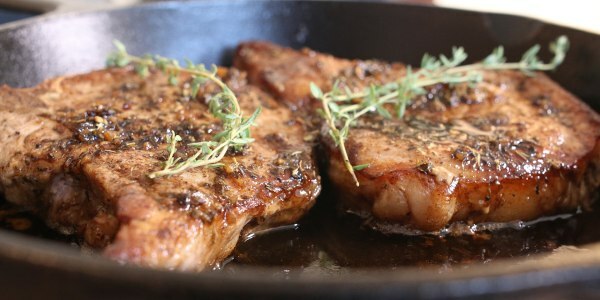 While Nosrat said she's more likely to cook pork chops in a pan (she likes using cast iron) than on a grill, one method is not better than the other. With either approach, it's important to preheat and then keep the temperature at a steady medium-high level while you cook the chops. Since adding the chops will lower the temperature of the pan, preheat the pan to slightly higher than medium-high, then quickly lower it to medium-high after you add the chops. Though it might seem like overkill to add fat to the pan when you're cooking a fatty meat, using a little oil is crucial for proper browning and even cooking, so Nosrat recommended adding a small amount of oil to the preheated pan just before adding the chops. (If you are grilling, simply rub a little oil on the chops before you put them on the grill.) "Even though you are cooking something with a good amount of fat on it, you also want to make sure you have a nice thin layer of oil in there because if you put the heat directly on the metal, it will get unpleasant burn marks," she explained. Otherwise the meat "will not brown evenly." As for what type of oil best, Nosrat said she chooses the type of oil she uses based on the cuisine she's cooking, but her go-to is olive oil. 10. Keep it moving for maximum browning. After you start cooking the chops, don't touch them until they have begun to brown and release from the pan, which takes two or three minutes. Then, start moving the chops around in the pan. "There are many different schools of thought when it comes to getting that beautiful browning on the outside — I am a believer in never staying still," Nosrat said. The reason to keep the meat moving is to get browning on as much surface area of the meat as possible (and don't forget the fat-cap! ), since "browning is flavor." In addition, Nosrat explained that no pan or burner is perfectly even, so moving the meat allows you to cook it more evenly. And forget the "international obsession" with grill marks, she advised. "Grill marks are such a waste of flavor," she says. "If you have grill marks, that means entire stripes of your food aren't properly browned." Once the chop is nicely browned on one side, which should take about five or six minutes over medium-high heat, flip it over. 11. Get to know the signs of doneness. Once your chop is well-browned on both sides, start testing it for doneness. The USDA recommends cooking all pork to an internal temperature of 145 degrees, but Nosrat (who prefers who chops on the medium to medium-rare side) advised that it's better to cook them a little under because "you can always cook a little less or little more to your taste." While you can salvage undercooked meat by throwing it back on the stove, you can't bring back a dry chop. To test for doneness, the chef said there's "no shame" in cutting your chop open to check because it's better to be safe than sorry. Nosrat said that your ultimate goal is to have a delicious meal, so don't feel bad if you need to poke a few holes in your meat to get there. "The nice thing is that it's also just a pork chop. If you mess it up you can try again next week!" After you remove the meat from the pan, let it rest for about five minutes. "I am absolutely a believer in resting," said Nosrat. "It just makes everything better." 12. Slice on the bias. "This is so particular and nit picky, but I do think that the way you slice the meat will affect its texture when you're eating it and so I am big on slicing against the grain," said Nosrat. She also likes to slice on the bias (at a slight angle). "I think it's a little bit prettier," she said. "You get bigger slices. I think they're less chewy when you do it that way." "I don't eat anything without condiments," said Nosrat. Something acidic, such as a vinaigrette or chili sauce, will offer "some relief from the richness of pork." Once you've mastered pork chops, you'll be able to enjoy an easy, quick and super satisfying meal any night of the week.